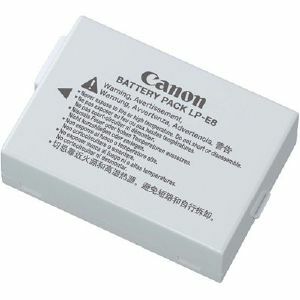 A genuine Canon battery pack LP-E8 which fits the EOS 550D, 600D, 650D and 700D cameras. This genuine Canon LP-E8 battery pack is an essential piece of kit. Keep a spare in your bag to ensure you never get caught out when you're out shooting. As it's made by Canon, you know you're getting a genuine, reliable product that will adhere to Canon's high standards and will power your EOS camera reliably. It is with regret that we are currently only able to fulfil orders for Li-ion camera batteries to most destinations within UK mainland, but not all – see the complete list of restricted destinations for Li-ion battery delivery. We are unable to supply to a non-UK address. This is because Lithium-Ion batteries, like the BP-511A and the type that most EOS cameras currently use, are classed as ‘Dangerous Goods’ by all UK carriers. We use a courier to deliver your battery orders, which may result in slight delays to our normal delivery timescales. EOS 550D, 600D, 650D, 700D.